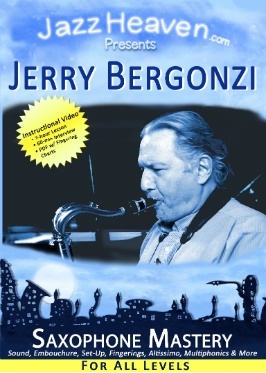 Spread The Word about Jerry Bergonzi's CONTEST & Win Cool Prizes! => Please still check out the blue links below to Jerry’s Killer Instructional Videos. “One of the best lessons I have ever had (continually have because it's on DVD). Almost all of the techniques also work for composition students. For a fantastic, brand-new AllAboutJazz.com review of these 2 Videos click here. The contest will end Monday, January 20th, at 11:59pm EST! SPECIAL PRIZE: Enter the drawing to win a PRIVATE LESSON with Jerry (Skype or in person) by uploading your own YouTube Video of playing along with Jerry's Play-Along!! Once you enter the contest, you will receive an email with the Play-Along version MP3 & PDF Chart! You can choose between a slower and a faster version. Pick the one you feel most comfortable playing with. STEP 3: Record a Video of yourself playing along with the MP3 -> using this exercise! STEP 4: Upload it to YOUR YouTube account! 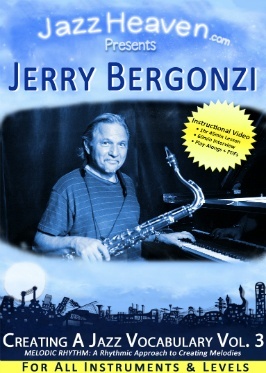 http://jazzheaven.com/bergonzi-contest Check out this cool Jerry Bergonzi Contest! The Response Video with the most YOUTUBE LIKES by the time the contest ends wins the PRIVATE LESSON with Jerry!